Now available a coin operated Popcorn Machine, that offers an excellent return on your money. This compact unit makes delicious Air popped popcorn, making it a healthy alternative to popcorn made with oil or other products. The unit is ideal for family venues or any location where space is an issue. The machine is completely self serve and very low maintenance. 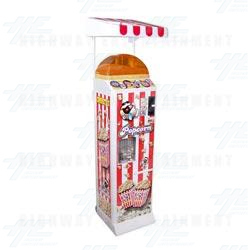 The customer simply pays the money into the slot and is given a movie styled popcorn container from the internal dispenser, which they place into the holder. The song Popcorn plays as the machine pops the corn with superheated air there on the spot. The entire process from inserting the slot to eating the popcorn takes less than 2 minutes. At the end of the transaction the area is filled with the smell of freshly cooked popcorn, which entices other customers to buy.